Rubenerd: First post from 37000 feet! First post from 37000 feet! 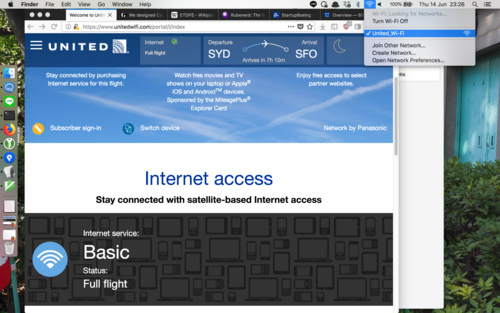 I’m flying from Sydney to San Francisco, to work from the company’s US office for a while. United has in-flight Wi-Fi and powerpoints, so I can post from the sky for the first time. What a time to be alive. The view is decidetly less interesting than drinking coffee at Bryant Park, Victoria Peak, Namba Parks, under Tokyo sakura, or the Boat Deck Cafe in Adelaide, not least because I find myself in the middle row on the isle without a window. But it’s… higher! So have a screenshot from the Wi-Fi login screen instead. And now over a lot of nothing! I assumed it could be for ETOPS reasons, but this Boeing PDF suggests that’s not a concern anymore. Because I could download a PDF and read it on a plane! Wild.